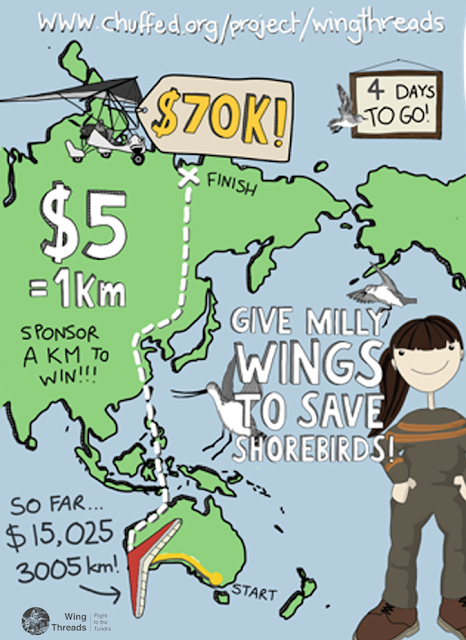 Wader Quest: Marvellous Millie and Wing Threads; just 4 days left but still time to help! Marvellous Millie and Wing Threads; just 4 days left but still time to help! We're into the final days of the crowdfunding campaign with only 3 days left to go! Since the last update, we hit the $15K milestone and as of yesterday are 3005km closer to the tundra. Woot woot! Thanks muchly if you're one of the delightful people who have donated to the campaign and helped us to make it this far. If you're also delightful and would like to join the delightful crew who have already donated (or just have a hankering for a totally rad 'Stints are Rad!' t-shirt or tea towel, which is completely understandable - and attainable! Winning! ), then be sure to navigate your way to www.chuffed.org/project/wingthreads before 5pm WST this Saturday 29th April! Feel free to share the crowdfunding love via email or on social media too if the urge overtakes you - it would be much appreciated! This past week has been pleasantly quiet and I've been using the time to focus on revision for my final flying test while experiencing intermittent flashbacks of teen angst prior to my driving test to 'get my P's' (as we used to say back in the day, which probably sounds a lot like what they say now in the day as well). Anyways, I'm only 3.8 solo hours off being totes pilot, so please do your bit by offering a sacrifice to the weather gods this weekend to ensure the winds up at White Gum will be in my favour! On that note, and to spare you from any of my further ramblings, I'll keep it short and check in once it's all said and done in just a few days - or should I say phew! days! Many thanks again and ciao for now!